For other uses, see Roti (disambiguation). For the Indonesian island, see Rote Island. For the cooking method, see Rotisserie. Roti (also known as chapati) is a round flatbread native to the Indian subcontinent made from stoneground wholemeal flour, traditionally known as atta, and water that is combined into a dough. Roti is consumed in India, Pakistan, Nepal, Sri Lanka, Indonesia, Singapore, Maldives, Thailand, Malaysia and Bangladesh. It is also consumed in parts of Africa, Fiji, Mauritius and the Caribbean, particularly in Trinidad and Tobago, Jamaica, St Lucia, Guyana and Suriname. Its defining characteristic is that it is unleavened. Naan from the Indian subcontinent, by contrast, is a yeast-leavened bread, as is kulcha. Roti in the Indian subcontinent. The word roti is derived from the Sanskrit word रोटिका (rotikā), meaning "bread". Names in other languages are Hindi: रोटी; Assamese: ৰুটী; Nepali : रोटी; Bengali: রুটি; Sinhala: රොටි; Gujarati: રોટલી; Marathi: पोळी; Odia: ରୁଟି; Malayalam: റൊട്ടി; Kannada: ರೊಟ್ಟಿ; Telugu: రొట్టి; Tamil: ரொட்டி; Urdu: روٹی‎; Dhivehi: ރޮށި; Punjabi: ਰੋਟੀ,ਫੂਲਕਾ; Thai: โรตี. It is also known as maani in Sindhi, ruti in Bengali and phulka in Punjabi and Saraiki. Many variations of flatbreads are found in many cultures across the globe, from the Indian subcontinent to Africa to Oceania to the Malay Peninsula to the Americas. The traditional flatbread from the Indian subcontinent is known as roti. It is normally eaten with cooked vegetables or curries; it can be called a carrier for them. It is made most often from wheat flour, cooked on a flat or slightly concave iron griddle called a tawa. Traditionally, rotis have also been made from the flour of millet, corn, jowar & even rice. Tandoori roti is cooked by sticking the flattened dough to the inside wall of a tandoor oven, where it bakes quickly at a high temperature. Like breads around the world, roti is a staple accompaniment to other foods. In Iran, the two variants of this bread are called khaboos[better source needed] and lavash. These two breads (the former of which is almost exactly prepared like Indian roti) are quite similar to other rotis. Ceylon/Kerala-style roti (porotta) served with curry. In Sri Lanka, probably the most popular type of roti is pol roti (coconut roti), made of wheat flour, kurakkan flour, or a mixture of both, and scraped coconut. Sometimes, chopped green chillies and onion are added to the mixture before cooking. These are usually thicker and harder than other roti types. They are usually eaten with curries, or some types of sambol or lunu miris and considered a main meal rather than a supplement. Another variety of roti popular in Sri Lanka is kottu roti, which is made up of paratha or godamba roti, These are cut into small pieces, small in size and rectangular or square in shape. Then on a square heating pan, vegetables and onions are fried. Eggs, cooked meat, or fish are added to fried vegetables and heated for a few minutes. Finally, the pieces of cut paratha are added. All these ingredients are mixed using two square pieces of steel. A peculiar sound is deliberately made while the mixing is done. The first person to make kottu roti is said to have made this noise to attract patrons to make them aware of the new delicacy. Depending upon what ingredients are used, the variations are vegetable, egg, chicken, beef, mutton, and fish kottu roti. It is sometimes prepared and served as a fast food dish. Godamba roti is another variety found in Sri Lanka. Plain godamba roti is eaten with curry or it can also be wrapped around a savory filling. In Indonesia and Malaysia, the term encompasses all forms of bread, including Western-style bread, as well as the traditional Indian breads. 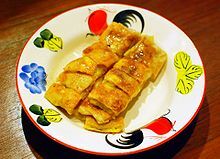 In Thailand, โรตี refers to the maida paratha—known in Indonesia as roti maryam, roti cane, or roti konde, in Malaysia as roti canai, and in Singapore as roti prata. Roti is eaten widely across the Caribbean, especially in countries with large Indo-Caribbean populations such as Trinidad and Tobago, Grenada, Guyana, Suriname, and Jamaica. Originally brought to the islands by indentured laborers from the Indian subcontinent, roti has become a popular staple in the culturally rich cuisines of these countries. In the Caribbean, roti is commonly eaten as an accompaniment to various curries and stews. The traditional way of eating roti is to break the roti by hand, using it to sop up sauce and pieces of meat from the curry. However, in the Caribbean, the term roti may refer to both the flatbread (roti) itself and the more popular street food item, in which the roti is folded around a savory filling in the form of a wrap. The roti wrap is the commercialization of roti and curry together as a fast-food or street-food item in the Caribbean. This wrap form of roti originated in southern Trinidad. It was first created in the mid-1940s by Sackina Karamath, who later founded Hummingbird Roti Shop in San Fernando, Trinidad and Tobago. The wrap was convenient, as the meal could be eaten faster and while on the go, as well as keeping one's hands from getting dirty. In Trinidad and Tobago, various wrapped roti are served, including chicken, conch, goat, beef, and shrimp. Vegetables can also be added including potato, pumpkin, and spinach as well a variety of local condiments, with pepper sauce (hot sauce) and mango chutney being the most popular. The roti wrap quickly gained popularity across the island and spread throughout the rest of the Caribbean. Roti shops are now abundant in Trinidad and Tobago, Guyana, Suriname, Jamaica, the United States, Canada, the United Kingdom, and the Netherlands, and the wrapped roti a staple street food. The wrap is now simply referred to as a roti or just roti. As Indo-Caribbeans moved to North American cities such as Toronto, New York City, Miami, Los Angeles, and Montreal, they exported with them the wrapped version of roti. This iconic version is what most North Americans known as roti. The growth in popularity has recently led to referring to the flatbread itself (roti) that surrounds the filling as a "roti skin" or "roti shell", a practice that is now common in both restaurants and commercial companies. Various types of roti are eaten throughout the West Indies. They are most prominently featured in the diets of people in Trinidad and Tobago, Guyana, Jamaica, and Suriname. Caribbean-style roti is primarily made from wheat flour, baking powder, salt, and water, and cooked on a tawa. Certain rotis are also made with ghee or butter. Sada roti This is a plain roti, made of white flour. It is the simplest roti to make, and is the most commonly consumed roti in Trinidad. It is a popular breakfast option there, and is enjoyed in combination with various curried meat and vegetable dishes. This type of roti is a staple food consumed for both breakfast and dinner by Trinidadians. A layered roti made with butter, usually ghee (clarified butter), but any butter can be used. Ghee is rubbed on both sides, then it is cooked on a tawa (a round, flat metal griddle used in Indian cooking). This gives the roti a crisp outside and small patches of light browning. When the roti is almost finished cooking, the cook begins to beat the roti while it is on the tawa, causing it to become light and flaky. Paratha roti is more rich and flavorful than plain roti. Paratha is enjoyed with almost any accompaniment. As with other rotis, it is commonly eaten with curries and stews. It is also traditionally eaten with fried eggs or egg dishes and a cup of tea. In Trinidad, parathas are colloquially called "buss-up shut" ("busted-up shirt") because the roti resembles a tattered and torn-up shirt. This is a roti where two layers are rolled out together and cooked on the tava. It is also rubbed with oil while cooking. This type of roti is eaten with a special halva when a child is born. Dhalpuri[better source needed] A roti with a stuffing of ground yellow split peas, cumin (geera), garlic, and pepper: The split peas are boiled until they are al dente and then ground in a mill. The cumin is toasted until black and also ground. The stuffing is pushed into the roti dough, and sealed. When rolled flat, the filling is distributed within the roti. It is cooked on the tava and rubbed with oil for ease of cooking. This type of roti is most commonly eaten with a variety of curries. It is also the roti of choice for the making of wrap rotis. A popular wrap made by folding a combination of meat and vegetable curries inside of a dhalpuri roti: The curry or stew often contains potatoes and/or chickpeas as a filler as well as the essential meat component, although vegetarian options are common as well. Popular fillings include curried chicken, goat, conch, duck, beef, shrimp, and vegetable. An assortment of optional condiments are also common such as pepper sauce and mango chutney. Aloopuri A roti similar to a dhalpuri, but with aloo (potato) substituted for the dhal. The aloo is boiled and milled, and spices and seasonings are added before being sealed in the dough. This aloo filling is also used when making aloo pie or aloo choka. Dotsi roti is common in Guyana. [a] A small amount of fat is placed in each piece of dough before it is rolled out to make the roti softer. Usually, vegetable oil is used, but butter, or margarine can also be used. Ghee is not used in everyday cooking, but is used on special occasions, especially amongst Hindus. The roti is usually clapped by hand or beaten a bit, hot off the tava, so it softens but does not break. A good roti in Guyana is very soft, with layers (almost like pastry layers if possible), which remains whole. The type of roti is determined by what is placed in the dough before it is rolled out. Various types include dhalpuri, aloo (potato) roti, and even sugar (to keep the kids busy, while the mother finishes cooking). In Guyana, a rolled-out, thin, flat dough like a roti that is deep-fried in ghee is called a puri, and is only made for Hindu religious gatherings. Therefore, a dhalpuri is not really a puri, as a puri and a roti are two different things. Another item prepared like roti is bake or bakes or floats. A Guyanese or Trinidadian fry bake seems to be more similar to an Indian puri. A bake is made with butter or margarine and has a different ratio of flour to fat. It is made much quicker than roti and is usually made in the mornings. Dough is rolled out and cut into shapes or rolled into small rounds. Guyanese bakes are fried, but bakes from other parts of the West Indies can be baked in an oven. Bakes are usually paired with a quick fry-up for breakfast or dinner, stewed saltfish, or eggs ("western" style, with onions, tomatoes, green peppers). Bakes are also made in other parts of the West Indies, including Trinidad, Barbados, and St. Vincent. In Trinidad and Tobago, a "bake and shark" is a popular street-food sandwich in which fried shark is placed between two halves of a sliced bake with local condiments. Pepper sauce, shado beni, garlic sauce, tamarind, and mango chutney are most common, as well as lettuce, tomato, and cucumber for fillers. In Suriname, roti refers mainly to dhalpuri or aloo puri. It is most often eaten with curried chicken. As in Trinidad and the West Indies, roti can also refer to the stuffed roti wrap. This dish is usually eaten out of hand. Due to a mass emigration of Indian Surinamese in the 1970s, roti became a popular take-out dish in the Netherlands. It usually includes chicken curry, potatoes, a boiled egg, and various vegetables, most notably the kousenband or yardlong bean. Another variation includes shrimp and aubergine. The meat with gravy, potatoes, egg, and yardlong beans are served side by side on a plate, with the aloo puri folded in fours on top. Roti, pronounced "rooti" in Durban, was initially introduced to South Africa by Indian migrants during the 19th century, and subsequently became incorporated into Durban cuisine. It is widely eaten by the Indian communities living in South Africa, and is either eaten as a flat bread or a wrap with locally made curries. ^ "... most Guyanese are unaware that there are different types of roti, which is the staple food in the diet of Indo-Guyanese. ROTI Table 1 shows the differences between eight different types of roti as used by Indo-Guyanese: paratha, dosti, cassava, daalpuri, aluu, chotha, puri and sada." ^ a b Alan Davidson (21 August 2014). The Oxford Companion to Food. OUP Oxford. pp. 692–. ISBN 978-0-19-104072-6. ^ Jim Smith (15 April 2008). Technology of Reduced Additive Foods. John Wiley & Sons. pp. 113–. ISBN 978-1-4051-4795-8. ^ Bruce Kraig; Colleen Taylor Sen (9 September 2013). Street Food Around the World: An Encyclopedia of Food and Culture. ABC-CLIO. pp. 301–. ISBN 978-1-59884-955-4. ^ a b c Wrigley, C.W. ; Corke, H.; Seetharaman, K.; Faubion, J. (2015). Encyclopedia of Food Grains. Elsevier Science. p. 19. ISBN 978-0-12-394786-4. Retrieved 9 February 2018. ^ Davidson, A.; Jaine, T. (2014). The Oxford Companion to Food. Oxford Companions. OUP Oxford. p. 692. ISBN 978-0-19-104072-6. Retrieved 9 February 2018. ^ a b Zahid, Anusha (9 October 2017). "Sunridge launches into atta". Aurora Magazine. Retrieved 9 February 2018. ^ "Rotika (रोटिका)". Spoken Sanskrit. Retrieved 25 March 2007. ^ Gadia, M. (2009). The Indian Vegan Kitchen: More Than 150 Quick and Healthy Homestyle Recipes. Penguin Publishing Group. p. 234. ISBN 978-1-101-14541-8. Retrieved 9 February 2018. ^ Gocmen, D.; Inkaya, A.N. ; Aydin, E. (2009). "Flat Breads" (PDF). Bulgarian Journal of Agricultural Science. 15: 298–306. ^ "Indian wheat cultivars: their carbohydrate profile and its relation to tandoori roti quality". Food Chemistry. 68: 185–190. 2000 – via Science Direct. ^ "Khaboos (Iranian Roti) Recipe". Archived from the original on 24 August 2007. Retrieved 15 July 2012. ^ "Experience true variety of cuisines at Hotel Riu Sri Lanka". Daily Mirror. 9 October 2017. Retrieved 9 February 2018. ^ a b Taylor, G. (2017). MasterChef: Street Food of the World. Bloomsbury Publishing. p. 214. ISBN 978-1-4729-4620-1. Retrieved 9 February 2018. ^ a b Briggs, P. (2018). Sri Lanka. Bradt Travel Guide. Sri Lanka. Bradt Travel Guides. p. 54. ISBN 978-1-78477-057-0. Retrieved 9 February 2018. ^ a b Kraig, B.; Sen, C.T. (2013). Street Food Around the World: An Encyclopedia of Food and Culture. ABC-CLIO. p. 328. ISBN 978-1-59884-955-4. Retrieved 9 February 2018. ^ "Food in true Trini style". Barbados Today. 2 September 2017. Retrieved 9 February 2018. ^ Gassenheimer, Linda (2 June 2017). "Popular Caribbean sandwich gives a taste of Jamaica". Norwalk Reflector. Retrieved 9 February 2018. ^ Daley, D.; Daley, G. (2013). Caribbean Cookery Secrets: How to Cook 100 of the Most Popular West Indian, Cajun and Creole Dishes. Little, Brown Book Group. p. 7. ISBN 978-0-7160-2314-2. Retrieved 9 February 2018. ^ Mason, T. (2016). Caribbean Vegan: Meat-free, Egg-free, Dairy-free Authentic Island Cuisine for Every Occasion. The Experiment. p. 67. ISBN 978-1-61519-360-8. Retrieved 9 February 2018. ^ Albala, K. (2011). Food Cultures of the World Encyclopedia [4 volumes]: [Four Volumes]. ABC-CLIO. p. 298. ISBN 978-0-313-37627-6. Retrieved 9 February 2018. ^ Rickford, J.R. (1978). A Festival of Guyanese Words. University of Guyana. p. 127. Retrieved 9 February 2018.